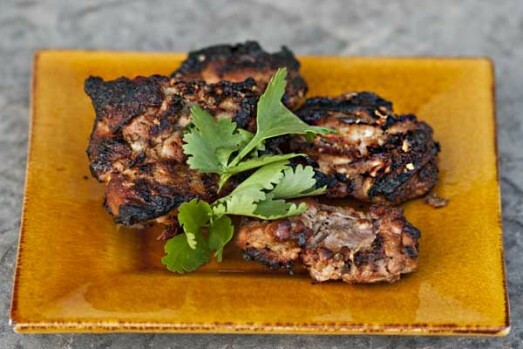 Tandoori chicken is an Indian classic. The name comes from the type of cylindrical clay oven, a Tandoor, in which the dish is traditionally prepared. The chicken is marinated in yogurt, lemon juice, and plenty of spices and left to marinate well. Once ready, serve the tandoori chicken with plain basmati rice or pulao (basmati rice with vegetables), raita (yogurt with tomatoes and cucumbers) and lastly, we like to add a mixed green salad on the side. This marinade can be used for different meats. Our preferred meat is chicken – thighs are best, preferably boneless and skinless – but most parts can be used. All must be skinless. Just be careful with breast meat because it dries out faster than thigh meat. Marinating overnight is ideal. Combine the first 10 ingredients, from the yogurt down to the ginger, in a flat baking dish. Mix well. Wash the chicken pieces and pat dry. After making a few light cuts in the chicken thighs (to allow better marinating) put all the pieces into the marinade. Make sure all the pieces are fully coated. Cover the dish and let the chicken marinate in the fridge for at least 6-8 hours. If you can marinate the meat the day before, even better. Tandoori meat is best if cooked in a tandoor oven. However, the barbeque does fairly well as a substitute and the chicken can be baked as well, though the BBQ is closer to the real thing. Line a baking sheet with aluminum foil and over it, place a grill rack. Brush the grill rack with a little oil to avoid sticking. Place the chicken pieces on the grill rack. Bake the chicken for 30 minutes on one side. After the first 15 minutes brush some of the left over marinade over each piece. After the first 30 minutes, turn the chicken pieces over and bake for another 30 minutes, again brushing the meat with left over marinade after 15 minutes. Since all ovens cook differently and the size of pieces can vary, make sure the thickest pieces are cooked through. If not, cook till done. If some of the smaller pieces are done sooner, remove them and keep them warm and then put them back in the oven for 4-5 minutes before serving. Serve on a platter, garnished with lemon slices and fresh cilantro. Brush the grill well with oil. Then preheat the barbeque to 400°F (200°C). Remove the chicken from the marinade. Place on the barbeque grill, close the lid and cook for 8 to 10 minutes on the first side. Turn (wait a bit if it sticks too much) and baste as needed. Cook on the second side for 8 to 10 minutes. Turn and continue cooking, as necessary until the chicken is cooked through, but still tender, about 20 to 30 minutes, depending on the heat of the barbeque and the size of the meat pieces. Boneless pieces cook faster than pieces with bone in them.